One year after Jacques Fred Petrus' and Mauro Malavasi's first production together, 1979 was to become one of their most hectic year in their common career. After a rather slow start in 1978 with their studio group "Macho's" mini-album Petrus/Malavasi aimed much higher this time with four complete albums simultaneously produced. One of them was Petrus "own" group Peter Jacques band (PJB), a name that played a little bit with his own name reversing the order of it. The first release of PJB was "Fire night dance" in 1979. PJB was, like all Petrus productions at the time, a pure studio concept and not a real band. Petrus simply recorded a few songs with his in house Italian songwriters, used some fancy photos on the album cover and hired a touring staff (that may alter) to act as the band on tour, and that was it. The touring staff in 1979 is unknown and the three persons on the cover seems to be there just for the looks of things. One that did get an offer though was Mic Murphy that acted as road manager of the funk band Kleeer at the time and later became the co-runner of Petrus Little Macho office in NYC. He was together with a few friends offered a touring contract but the money was ridiculously low so that was a no deal. The release only included four extended tracks like most of the early albums of Petrus and Malavasi. The music breathes power and energy with sleek melodies even though the material is inconsistent. The first track "Walking on music" got the perhaps best hit potential with a fast tempo explotion of strings, hight pitched voices and a sleek melodie. "Devil's run" got a more modern and funkier sound palette showing a strong piece with a long appealing break. The tracks on the B-side continues in the same style, fast, energetic and polished disco but without making any major impression. Besides Malavasi as a lead character that composed, arranged and conducted the album fellow Italians of Gianolio and Trevisi played crucial roles. Trevisi even was the co-arranger, composer and conductor together with Malavasi. The engineer of Maurizio Biancani in the Bologna studio was also an important man at the time with his skillful technical knowledge that was well used by Petrus. Besides Malavasi, Gianolio and Trevisi no other musicians are mentioned on the album that instead refer to the musicians from Macho's album in 78 as the musicians on PJB. The most well known of them was Leroy Burgess that worked with many great disco acts during the late 70s and early 80s like "Black ivory", "Aleem" and "Inner life". Petrus himself was both the producer and executive producer even though all the productions practically were a thing that Malavasi handled. Petrus also contributed with the idea of the cover that was different on the European and American releases. The European was a bit dark an mystical and the US release more colorful and expressive. The debut was musically not very interesting, the tracks sounded very much the same but the first two tracks showed a potential that also brought attention to the new band. Malavasi also had the chance to learn and develop the sound that led to even further and greater success later on. When it comes to PJB they were to come back one year later and this time with a more interesting and broader material. "Dire night dance" sold not bad though and in that perspective it was a relatively good affair. A better production of Goody music to catch that year was Revanche's one and only mini-LP "Music man" that showed some real disco potential, an album that can be highly recommended. 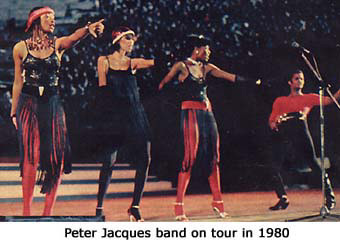 Among all the productions from the first period of Petus and Malavasi between 1978 and 1980 PJB's album in 1980 together with Change's debut the same year have to been seen as their two most successful ones, both musically and economically. After the minor success with "Fire night dance" in 79 their second and highly competitive, full-size, 6 track album "Welcome back", with its surprisingly modern sound, became a masterful result. What strikes you at first is the melodic and harmonic sound performed with a great amount of fluency, in other words a very nice and easy listening sound! The Chic influences are also more present than in 79 and perhaps best illustrated in the title track with its quirky hard slapping guitar sound. The whole album is competent but a few tracks exceeds the rest, like the funky "The louder", sing along and happy "Is it it" and the classy knocker "Mighty fine", maybe the most well balanced and tastefully arranged track from the album. All in all this was PJB's most enjoyable set of music with enough quality and variation among the tracks to make it one of the better disco albums of the year and over all. This year PJB also did get a much more band like identity. 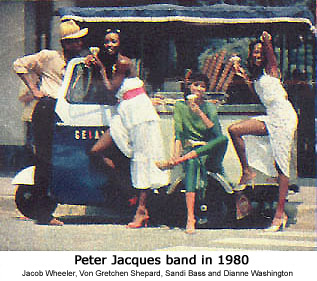 The new and even more successful PJB in 1980 included Jacob Wheeler (lead vocals), Dianne Washington, Sandi Bass and Von Gretchen Shepard, all depicted on the cover and, except Sandi Bass, natives from Chicago, Illinois. Wheeler was the key figure and had Petrus confidence finding the new PJB members. Despite being presented as the "Peter Jacques band group" on the album cover they had nothing to do with the creation of the music it self and they didn't play any instruments either. Their role was simply to look good and sing nice. However contracted for their "pretty faces" all of them had more to offer than just that. In fact they had all a really versatile and interesting background. Jacob Wheeler, born in Chicago attended Wheeler an art school in the same town before he began to study at the Shennan school of music in Los Angeles where he learned how to sing, play guitar and dance. During that period he developed his skills and became a particularly good dancer. In 1979 he formed the duo "Jacob and Olivier" and worked at the same time at a theater in Broadway. He was discovered by a producer leading to roles in musical comedies before he was engaged by Petrus as member of Peter Jacques band in 1980. He married fellow PJB member Sandi Bass. Dianne Washington, born in Chicago she became first a mannequin and then ended successful studies both in the song and dance disciplines in Paris. She participated as a dancer in a group In Paris. She made a positive impression on Wheeler that hapen to see one of her dancing performanced and not long after asked her to be a part of PJB. Sandi Bass, born in Nashville, she soon moved to California after finishing her studies. She moved to an apartment together with a model and made a living doing different ads. One day her roommate dislocated an ankle and she jumped in as a model with great result. She moved to Texas and worked as a model for three years. During this period the managed to enchant important people in the showbiz as singer as well and during a fashion/music convention she was proposed a contract that eventually led to roles in several musicals of which the most notable is "Hair". It was during one of these musical occasions she was discovered by Wheeler that not only invited her to become a part of PJB but also married her. Von Gretchen Shepard, born in Chicago where her mother was a high school teacher, she became a Harvard student. Despite being shy and introvert she managed to win the "Miss Black America" contest in 1975 and earned status as supermodel. Soon after she was chased by media and different producers for roles in movies and television and articles in various fashion magazines. She was a guest at Don Cornelius legendary Soultrain TV show and featured the front cover of Ebony magazines February issue 1977 (picture). But the most noted performance was made in the TV-series "Chifs" where she played the role of a singing police investigator. Another result of the Miss Black America title gave her the opportunity to participate in various musicals. It was during that time she met Sandi Bass that introduced her to Wheeler that eventually made her the fourth member of PJB. She's sister to Kiki Shepard, former notad hostess of "It's Showtime at the Apollo" 1987-2002 and minor role actress in TV-series like "Baywatch", "A different world" (featuring Denice Huxtable AKA Lisa Bonet and Kadeem Hardison) among others. After five long years Petrus wanted to create just another PJB album. This time without his musical mastermind Malavasi and in a poor economical situation together with the new musical world that looked much different from the one back in 80. Wheeler, Bass, Washington and Shepard were not used again. Instead Petrus put together a whole new band for the third time on the third album comprising the Brazilian Ilto Sampaio, Betty Lami, Carin McDonald and the Swede Carmen Bjornald (the blonde to the left). Even though Petrus tried he couldn't revive the power and light from the early years and the album "Dancing in the street" in 85 was a weak effort. Petrus even managed to draw Romani back in action as songwriter and producer after his departure in 83. But even the talented Romani couldn't create a miracle that PJB so much needed. Despite rather good poptracks like the chartbusters "Going dancing down the street" and "All right let's go" (same tracks as "Let's go together on Change's album the same year) released the hot summer of 1985 PJB's last album couldn't lift it self in the hair and the rest was musically pending from average to poor. Both Change's album and B. B. & Q band's was better that year, especially B. B. & Q. band's groovy Jam/Lewis inspired eight piece gem but ironically PJB did get some slightly more media attention that year. This fact clearly showed the uncertainty and confusion in the black music inspired world during these years when main stream pop/synth music experienced more commercial attention and were the favorites among the record companies in favour of the musically more original and tight funk, soul and R&B productions. The saga of PJB was thereby over and no more catchy grooves was to be heard from them again. Most of the more or less actual members of this changing project continued in other fields than music. Von Gretchen Shepard and Sandi Bass continued their earlier careers as models. Sandi became a very successful model working for top designers in Paris, Rome and Tokyo. After that she returned to America and appeared on different TV shows, published several articles about modeling and fashion in different magazines both in the US and the UK. Most recently Bass has worked as modeling/talent scout with her own company Bass International Modelscout & Management. Sandi did also marry Wheeler in the late 70s and they have at least one child together. Among the members of the last line up from 85 the Swede Carmen Bjornald is the most interesting. She became later on a successful jewelry designer with her own collection. The 39 year old Brazilian Ilto Sampaio today works as masseur in the Swiss basket team "Giocatori". 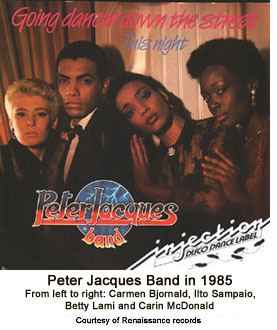 One, perhaps two years after PJB's last album Jacques Fred Petrus was killed as a result of illegal affairs with the Mafia. It was a sad end for a rarely seen power force in dance music. There are several bootlegs on CD in circulation, but none of them are official releases, even though they are sold under that premises, so, be aware of those impostors! On the 28th of March 2007 "The very best of Peter Jacques band" was released on the Italian record label Fonte records. Please click on the covers below to see a complete list of songs from each record.